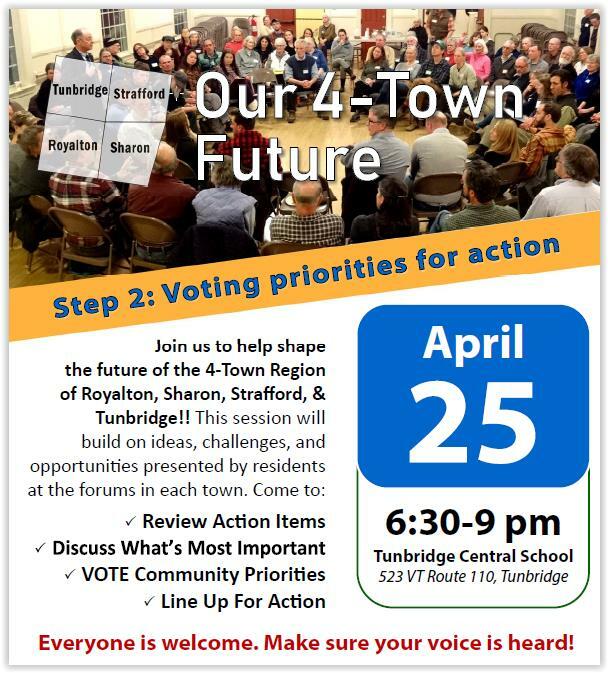 On Thursday, April 25th, all community members of the 4-Town region of Royalton, Sharon, Strafford, and Tunbridge are invited to participate in the second phase of the "Our 4-Town Future" Community Visit. The session will be held from 6:30-9pm at the Tunbridge Central School. At the April 25th meeting, VCRD will facilitate a discussion of the ideas that came out of the forum discussions, where communtiy members will advocate for causes of particular interest, and finally vote for issues they want to move forward in the coming year. The issues that are selected will become the focus of task forces in the future. In May, VCRD will return with a resource team of state, federal, and non-profit leaders for a final visit to help the new task forces build action plans and resource connections to implement the priority projects. All community members, whether they participated in any of the forums or not, are encouraged to come on April 25th to vote for issues that will become the focus of working groups in the coming year. Mark your calendars and come play an active role in shaping the 4 Town region's future. The "Our 4-Town Future" Community Visit process is produced by the Vermont Council on Rural Development (VCRD) in partnership with the Vermont Community Foundation. The Community Visit program is a way for towns to engage and bring together their residents, set common goals and directions in a neutral and facilitated structure, and access resources that will help them take action on those goals. VCRD is a non-profit organization supporting the locally-defined progress of Vermont's rural communities. Learn more at https://vtrural.org/ programs/Community-Visits or contact Jenna at 802-225-6091 or jenna@vtrural.org.